You are invited to join Joseph & Heather Z with Special guest Daniel Amstutz for our Monthly Prophetic Meeting! This is going to be a time of Worship, Encouragement and Prophetic Ministry. Come expecting to receive a timely message and prophetic ministry from Joseph Z, Daniel Amstutz and more! You are invited to join Joseph & Heather Z with Special guest Daniel Amstutz for our first Monthly Prophetic Meeting of 2019! Special ONE HOUR of LIVE Prophetic Ministry! Like and Subscribe to the Joseph Z facebook page for updates and notifications! 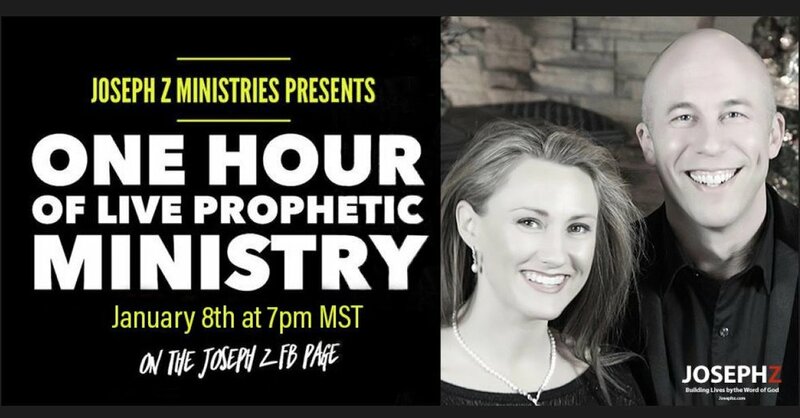 This is A SPECIAL ONE Hour FACEBOOK LIVE PROPHETIC EVENT with Joseph Z that we believe will greatly minister to you and everyone you invite!! Please invite all your friends to this special time of ministry! !